Is an insecticide that harms bees bad for deer? A popular, commonly used insecticide might be affecting the health of white-tailed deer, according to a new study. Neonicotinoids are widely thought to play a role in the decline of bee populations, and research has shown some effect on birds. But the new research focuses on how the chemical might affect large mammals. "This really shocked us, because we didn't put that into the experimental design, and we realized that our whole study was contaminated because this imidacloprid was already present in the environment," said study author Elise Hughes Berheim. Berheim suspects dust from a nearby cornfield, or the corn and soybeans the deer ate, caused the contamination. The neonicotinoid class of insecticide is often used as a seed treatment: the corn seeds are often coated with the insecticide before planting. Previous research has shown dust from fields can spread the insecticide. It's also water soluble and can move in water flowing off of fields. The captive deer in the study were exposed to the insecticide from May through October, when it would likely be found in the wetlands or streams deer drink from. Spring is when the chemical is most common in the environment. "That's the reproductive season for deer, so the exposure would occur right in spring and potentially result in fawn mortality," said South Dakota State professor Jonathan Jenks, senior investigator on the study. The study found that the fawns that died during the study had significantly higher levels of the insecticide in their spleens than those that survived. That points to a correlation, Jenks said, but does not prove the insecticide killed the fawns. Researchers analyzed the level of imidacloprid in deer livers, brains, genital tissue and spleens. Jenks said the results show the deer spleen is an important indicator of an animal's exposure to neonicotinoids. The insecticide is a neurotoxin, which means that it works by disrupting the brain activity of insects. But the study found that, in deer, there were high levels of the insecticide in their spleens. "It suggests that there is some sort of immunocompromise that's occurring because of the exposure to the chemical," said Jenks. Deer exposed to imidacloprid showed signs of hypothyroidism and lethargy, said Jonathan Lundgren, another researcher on the study who works with the private research firm Ecdysis. "What we found seems to be more related to the immune function and endocrine disruption, and so that was kind of unique, from our perspective," he said. "This has been seen in other vertebrates but it hasn't been studied that well, certainly not in large vertebrate like white-tailed deer." The researchers say similar effects have been seen in lab studies with mice, but this is the first time a possible immune system connection has been found in deer. 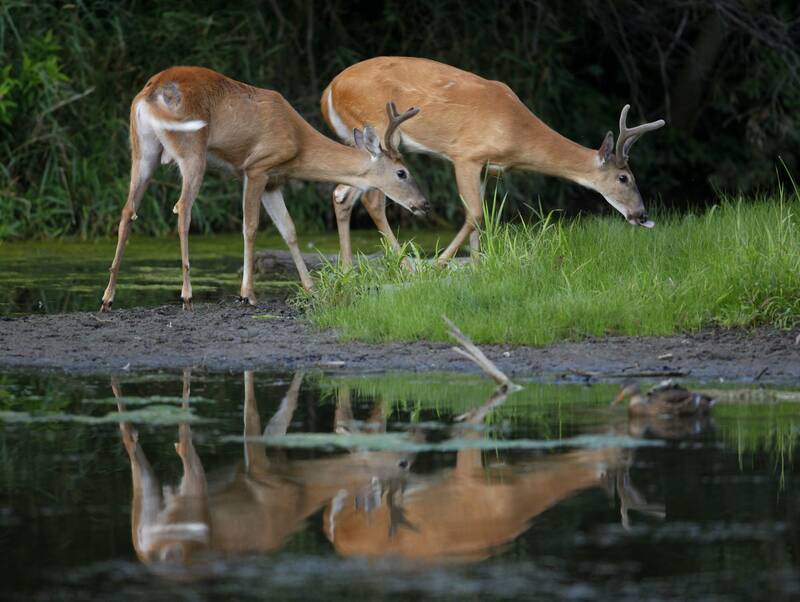 Researchers tried to ensure the doses of insecticide given to captive deer were similar to what they might be exposed to in the wild, by using levels known to exist in streams and wetlands. They also tested 367 deer killed by vehicle collisions, illegal hunting or disease across the state of North Dakota from 2009 to 2017. More than half of the wild deer showed exposure to imidacloprid, and of those, more than 75 percent had relatively high levels of imidacloprid in their spleens. In fact, according to Lundgren, some wild deer had higher levels of the chemical than those being exposed to the chemical in captivity. "The spleen concentrations in the collected deer were 3.5 times higher than what we had in our study that produced these abnormalities in the deer. So something is going on out there, and this definitely warrants a heck of a lot more attention," said Lundgren. It's important to point out this research does not find a cause-and-effect link between neonicotinoids and the health issues in deer. But Berheim believes the findings are a clear call for more research on how a chemical designed to kill insects might be affecting mammals, as well. "I think the next research to do is to really look at wild populations, look into the effects that are happening there," Berheim said. "And to really just start a conversation. Just looking at — if it is in deer, in wild populations, what does that mean?" The study was published in March by the journal Nature: Scientific Reports.